The Sigelei Etiny Plus Kit is the big brother of the Etiny Starter kit. The Etiny Plus kit includes the new Etiny Plus Mod and the Etiny 2 tank. Looking at the Etiny Plus Mod first this looks like a nice simple starter device. There is a 800mAh internal battery so no faffing with removing batteries – simply plug into a USB outlet to charge. You get a fire button plus 2 adjustment buttons – up and down – to select between the 3 power levels – High, Medium and Low. You can buy the Etiny 2 tank in the full kit or it is for sale on its own – the package contents will vary. To make life easier the Etiny tank has a push in / pull out coil design. Also you get a wide range of airflow adjustment with 5 airflow inlets which you can expose to either fully open or half open and any adjustment in-between. S2 – Nichrome 1.3ohm 8-20W (best 10-15W) – included in the kit and tank only package. S2-H – SS316L 0.6ohm 10-35W (best 18-30W) – included in the tank only package. MC Coil – Ceramic 1.3ohm 8-20W (best 10-15W) – included in the kit version – apparently ideal for CBD E-liquid. There are 4 colours to choose from – Onyx, Neon Grey, Crimson, Champagne and Platinum. This looks like a decent starter / intermediate kit and could be great combined with Nic Salt or CBD e-liquid. 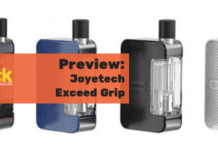 Will the Sigelei Etiny Plus Kit be on your shopping list? Let me know what you think in the comments below!